Digs start at S. Babila, De Amicis and Washington stations. 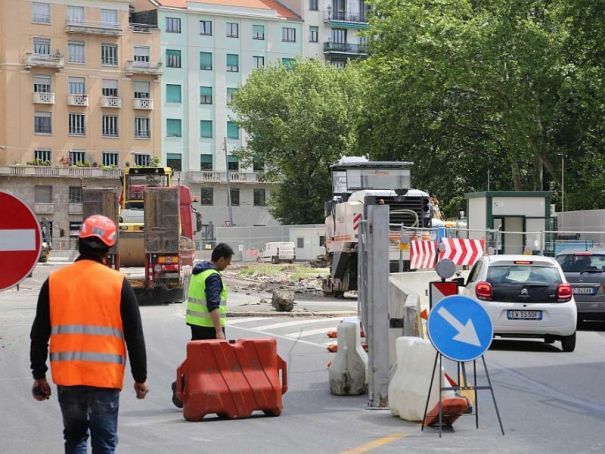 Work on Milan’s latest metro line – the M4 “blue line” – which will eventually connect Linate airport for 15 km across the centre and out to S. Cristoforo in the city’s south-west sector, is getting under way, with temporary woes for surface traffic. By far the most complicated site, the S. Babila dig in the city centre will cause major disruption “for as long as it takes”. From Tuesday 28 June, only bikes, motorbikes and taxis will be allowed to transit the square in the direction of Corso Venezia and Corso Europa, while two days later the square will be definitively closed to all traffic. The S. Babila taxi stand will be shifted to Corso Monforte. The work will also affect public transport, with bus route 54 and the night bus routes which substitute metro trains on the M1 and M3 lines re-routed around the dig. The city’s transport authorities plan to distribute ample copies of leaflets on the new traffic arrangements, as well as putting up detailed signposting for drivers, including electronic display panels. The discomfort will be amply compensated when S. Babila station opens, connecting the new line to the M1 “red line” and bringing airline passengers speedy and cheap connection to a far greater metropolitan area. Work on other stations across the city will cause a smaller amount of local disruption. From Wednesday 29 June for two months, part of Via S. Vincenzo will be closed to traffic as work on the De Amicis station begins. From 2 July until the end of the work, a stretch of Via Foppa will be closed for work on the new Washington Bolivar station. Here, too, public surface transport will be re-routed around the digs, affecting lines 50, 58 and 61. Like its predecessor, the recently completed M5 “lilac line”, the M4 will feature driverless, automated trains with the latest technology, including glass barriers between the tracks and the platform which open only when the train is present in the station and at a standstill. It is planned for completion in 2021. City hall points out that the new line will not only bring faster, cheaper and safer connection between the financial centre and the airport, but will bring a sharp reduction in atmospheric pollution caused by surface traffic. Apart from the connection with the M1 line at S. Babila, the M4 will also connect with the green M2 line at S. Ambrogio.